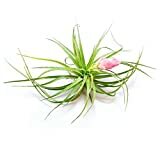 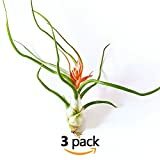 Tillandsia Bulbosa growing epiphyte leaf plant of the genus Tillandsia also known as Air plant, Tillandsia Bulbosa perennial evergreen used as ornamental plant, can grow in mediterranean, subtropics, desert climate or as houseplant and growing in hardiness zone 10b+. 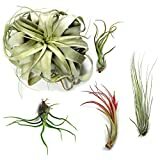 Leaves color green, purple, pink, red, mostly the colors mix with green-gray, and change next to the bloom area to light colors in the base of the leaves there is shape like bulb, leaves absorb moisture from the rain or humidity. 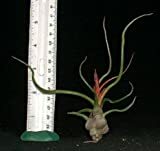 Flower color purple in roll shape and small role grow on connected bracts, one stigma and three stamens, each plant bloom once in life, it takes more than 3 years.